This is a Chinese hanging scroll from the 16th century, and the treatment is being conducted on view to the public in gallery 178. 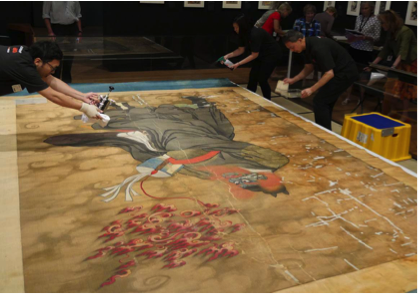 The painting is currently in poor condition, but in partnership with colleagues from the Smithsonian Institution, the conservation team will clean the image and remount the scroll. Preservation of Auloi – musical instruments from the Sudan The instruments were excavated in northern Sudan in 1921 and have never been treated. 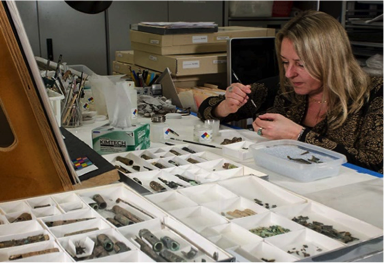 Expected to last multiple years, the project is a collaborative effort between conservators and conservation scientists, curators from the Musical Instruments and Art of the Ancient World departments, and scholars from other institutions. The Lab tour is free but will be limited to 20 to 30 people. There are two labs to tour. We will divide into two groups so that we can comfortably tour each lab. After the tour there are several dining options for your consideration. In the Museum there are several restaurants ranging from casual to upscale. Please note the closing times for the museum restaurants are between 8 and 8:30 PM. There are many dining options in the area but if you would like to join your ASM Group we will be gathering at Thaitation www.bostonthaitation.com after the tour for dinner. The restaurant is located at 129 Jersey St. – a short walk from MFA. Please indicate if you will be joining us for dinner. Individual checks will be provided. Please register for the tour and dinner by Tuesday, Oct. 24. Each attendee must register separately since we are required to submit our list to MFA prior to the tour. Remember the tour size is limited so please register early. Information on where to meet as well as MFA security protocol will be provided separately.